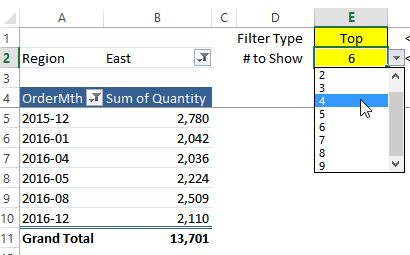 Use the Top 10 filter feature in an Excel pivot table, to see the Top or Bottom Items, or find items that make up a specific Percent or items that total a set Sum. 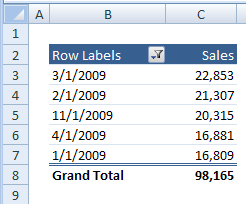 You can summarize your data by creating an Excel Pivot Table, and then use Value Filters to focus on the top 10, bottom 10 or a specific portion of the total values in your data. For example, insteading of showing the total sales for all products, use a filter to show just the top 10 products, or narrow it down to the top 2. In the screen shot below, the City field has been filtered to show only the top 2 cities, with the highest sales amounts. Or, if you want to focus on the poor performers, you can use a value filter to find the bottom 5 products or sales regions. In the example shown below, there are 24 months of Order dates in the Row Labels area. In the Values area, you can see the total sales for the first few order dates. 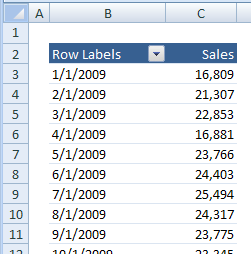 To filter the pivot table, so it shows only the Top 10 order dates, follow these steps. In the Pivot Table, click the drop down arrow in the OrderDate field heading. In the pop-up menu, click Value Filters, then click Top 10. Click OK, to close the Top 10 Filter dialog box, and apply the Value Filter. As shown in the filtered example below, only the top 10 Order Dates are now visible, still sorted by order date. To sort the amounts in descending order, right-click on one of the amounts, and click Sort. Then click Sort Largest to Smallest. After you add a Top 10 Filter, you can change it, to show a different result. In the Top 10 Filter dialog box, change the number of Items to 5. The results change, to show only the 5 order dates with the highest sales amounts. The Top 10 filter helps you find the highest amounts, but sometimes you need to find the lowest amounts, to focus on those. Even though the filter is named "Top 10", you can use it to find the bottom amounts too. To see only the Bottom 10 order dates, follow these steps. In the Top 10 Filter dialog box, select Bottom from the first drop down. The results change, to show only the 5 order dates with the lowest sales amounts. When you've finished analyzing the filtered data, you can clear the Filters, to see all the data again. 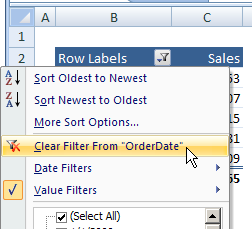 Click Clear Filter From OrderDate Field, to remove the filter criteria, and show all the data. In addition to filtering for the top or bottom items, you can use a Value Filter to show a specific portion of the grand total amount. In the screenshot below, you can see that the grand total sales amount is 663,732. Ten percent of the grand total is 66,373, and you can use a Top 10 filter to find the top or bottom dates combine to total at least that amount. To see only the top selling order dates that contribute to 10% of the total sales amount, follow these steps. The results change, to show only the top 2 order dates, because their combined sales are greater than 10% of the original grand total amount. 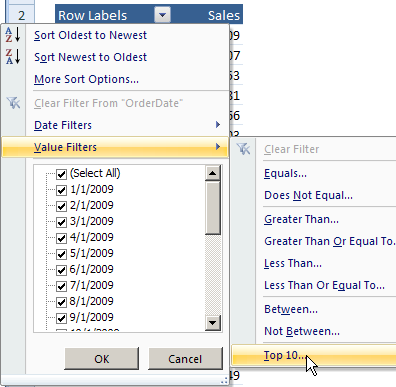 Another way to use the Top 10 Value Filter is to find the items that make up a specific sum. For example, from the order dates with the lowest sales amounts, which order dates would combine to total at least 100,000 in sales. To see only the bottom selling order dates that contribute to 100,000 of the total sales, follow these steps. 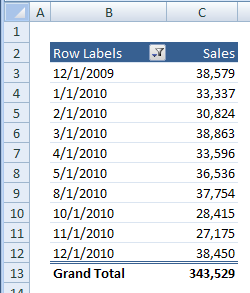 The results change, to show only the 6 lowest order dates, because their combined sales are at least 100,000. As you can see in the pivot table shown below, the bottom 5 order dates only total 98,165, so the 6th lowest order date is also included in the Value Filter results, achieve our 100,000 minimum. The selection boxes in the Top 10 Filter dialog cannot be linked to worksheet cells, to get a value. 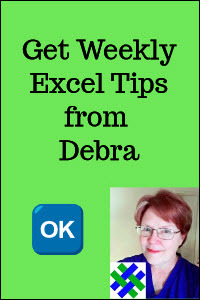 However, you can use an Excel macro to get the values that have been entered on a worksheet. In the screen shot below, when you select from the drop down lists in the yellow cells, a Top Ten filter is applies to the OrderMth field, with the settings from cells E1 and E2. This example is in the download file, on the Top10Filter sheet. Read the sections below, for details on how the workbook is set up, and to see the code that runs the filter. On the Top10Filter sheet, the yellow cells (E1:E2) contain data validation drop down lists, based on those lists. Cell E1 is named TypeSel, and cell E2 is named NumSel. To use the selected filter type in the macro, it will be changed to a number. 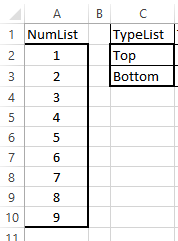 On the Lists worksheet, to the right of the TypeList, a number has been entered for each filter type. 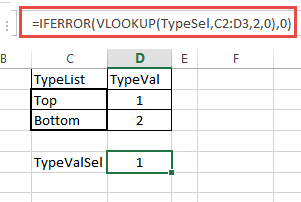 Then, in a cell named TypeValSel (D5), a VLOOKUP formula returns the number for the Type selected in cell E1 (TypeSel), on the Top10Filter sheet. If you record a macro while applying a Top 10 filter to a pivot table, you would see either xlTopCount or xlBottomCount in the recorded code. Those are constants for the Type argument when adding a pivot table filter. It will be easier to send the "Top" or "Bottom" selection to our macro, if we use the numeric values of those constants. To filter the pivot table automatically, when a value is selected from the drop down lists, a Worksheet_Change event is added to the Top10Filter sheet code module. NOTE: There is also a version of the macro for multiple pivot tables on the same sheet, based on the same data source. MsgBox "Could not apply filter"
When a change is made on the worksheet, the Worksheet_Change code is triggered. It checks which cell has been changed (Target), and compares that cell's address to the addresses of the TypeSel and NumSel ranges. If one of those cells is a match for the Target address, the filter code runs. If any other cell was changed, the filter code does not run. First, the screen updating is turned off, to prevent the macro from running slowly. Then, all filters are cleared from the OrderMth field. If both are higher than zero, the Top 10 Filter is applied, using the type number and number of items from the yellow cells. Finally, the screen updating is turned on, to allow Excel to display the changes. If there are multiple pivot tables on the same sheet, based on the same data source, use the following code to filter all of them. 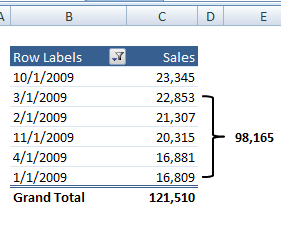 All pivot tables must have the designated Row Field and Value Field, but can have other column or data fields too. strDF = "Sum of Quantity"
To experiment with the filters, you can download the sample file. The file is in xlsm format, and contains macros.